Russia’s wide-reaching anti-terrorist campaign has helped to stabilize the situation on the ground in Syria and has paved the way for a ceasefire and reconciliations. RT has gathered 10 of the most dramatic videos of Russia’s strikes over past six months. Some of the most jaw-dropping footage since the Russian Air Force carried out its first airstrikes in September was the cockpit view of Russian aircraft taking off from Khmeimim airfield, carrying out sorties and returning to base. It was strategically important to cripple terrorists’ financial flows by destroying infrastructure such as refineries, as well as tanker vehicles Islamic State used for smuggling oil to Iraq and Turkey. Another key goal was to cut terrorists’ supply routes, as was the case of a bridge over the Euphrates River which Islamic State (IS, formerly ISIS/ISIL) used to deliver supplies from Iraq, according to the Russian General Staff. Immediately after IS terrorists claimed responsibility both for the downing of the Russian passenger plane in Sinai and mass shootings in Paris in November, Russia stepped up its bombardment of terror targets. Russian servicemen at Khmeimim airbase responded to terrorists by scribbling “for our people” and “for Paris” on bombs that soon hammered the enemy. Russian long-range strategic bombers have conducted their maiden combat flights during the Syria operation, launching hundreds of tons of smart bombs and cruise missiles on terrorist targets. Russian forces moved beyond air-to ground operations when its warships in the Caspian Sea for the first time fired cruise missiles at IS installations. The video released by the Defense Ministry included a map that tracked them whole way to Syria through Iranian and Iraqi airspaces. 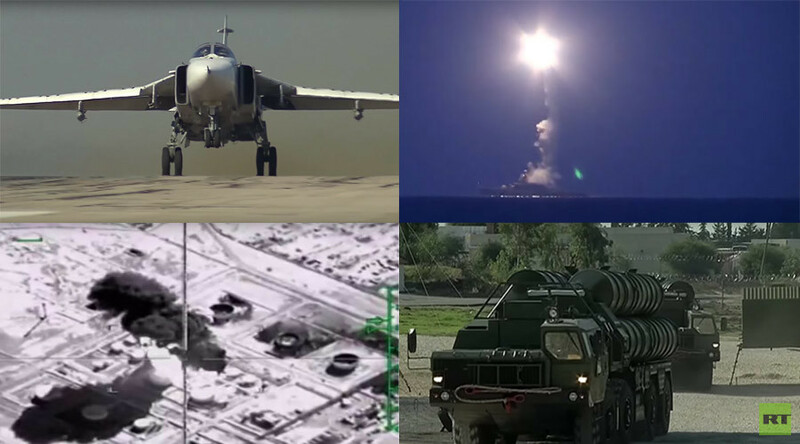 During the Syrian operation the Russian military also struck IS targets with Kalibr land-attack cruise missiles launched from a submarine in the Mediterranean Sea. After Turkey’s downing of the Russian Su-25 bomber in Syrian airspace, Moscow deployed the S-400 Triumf system at Hmeymim. Russia’s most advanced air defense system is ready to detect and destroy any target within 400 km radius that would jeopardize the safety or Russian aircraft and military personnel. In order to provide defense and support for Russian military action in Syria, combat helicopters deployed at Hmeymim were equipped with wide range of armaments and were ready to take off and to put it to good use at any moment. In total the Russian Air Group in Syria conducted more than 9,000 sorties, according to the Defense Ministry, which on a regular basis released details and footage of the precision strikes that eliminated numerous depots with munitions, arms and material assets, as well as terrorists training camps since September 30, 2015.